He might not play for one of Ohio’s most prominent high school programs. 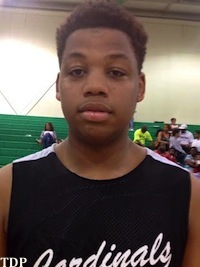 And being that he chooses to run with an out of state AAU team, class of 2016 power forward Omari Spellman is sometimes overlooked when experts argue over the top prospects in the Buckeye State. However, those days need to come to an end, right away, as Spellman has taken his game to a new level. On Friday night, Triple Double Prospects got a chance to check out Spellman on the AAU circuit with Team Scan, a Nike sponsored squad based out of Spellman’s hometown of New York City. Playing in one of the premiere AAU events of the spring, the Boo Williams Invitational in Hampton (VA), Spellman was the most dominant and impressive prospect on the floor in the game, a Team Scan win over the Upward Stars out of South Carolina. After starring for two years at North Royalton High School, a southern suburb of Cleveland, Spellman has made a name for himself with excellent statistics, but due to the location and schedule of his high school team, he still remains somewhat of a mystery man to many. In Team Scan’s game, Spellman’s talent, however, was not a mystery. The thickly built 6’8 post shot the ball out to the three-point line with ease, finished around the rim with power and touch and completely dominated the high and low post offensively. A big man with great hands and feet, Spellman is extremely skilled for a player of his size and weight, while also having the strength to simply move opposing big men out of the way. At the conclusion of the game, Spellman left no doubt that he is one of the top-five class of 2016 prospects in the state of Ohio, joining the ranks of the other elite players in what is considered to be the deepest and most promising high school class in the state at the moment. Hopefully, fans, scouts and coaches will get to see Spellman play more inside of Ohio borders, but either way he is a prospect to keep a close eye on as he continues to develop his conditioning. After the game, Spellman mentioned offers from several schools this spring, including Wake Forest, Cincinnati, Villanova, UNLV and Miami (FL), as well as interest from several top-15 programs such as Arizona and Florida. Starring on the Nike circuit as one of the top post prospects in the 16u division at a tournament like Boo Williams, expect for even more high major coaches to make Spellman one of their top interior targets heading into the July evaluation period.